Sermons are given by Pastor Steve Hisel - unless otherwise noted. 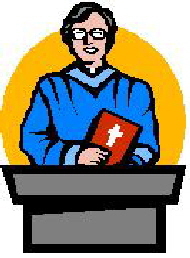 This color indicates that the sermon is one of a series. Live in the moment, not the past, or the future. Spring Feasts appointed by God are to be celebrated as they point to Christ. Why does God have mysteries and who gets to know them? It is not always easy, obvous or understandable about the ways of God. Would you take the place of a deserving death row inmate? Why Not, Christ Did! The fruit of our deeds is indicative of our state with God. All need to change from the path we were on and lets help others transform their lives too. Nothing kills faith more efficiently than doubt; and vice-versa. Christians bring knowledge of God, which is the LAW. The strength of Christian Faith is "Fit for Purpose"
Pray for our leaders, accept God's perfect will, speak the truth contained in the Word of God in love. Unsubscribing takes commitment and diligence and, of course, GOD. Let us develop our prayer life in 2019. There is no chance of lasting piece without Jesus. Christian JOY is the bait we need to be attractive to others. The Advent Message of FAITH for the season in which we live. The Advent Message of HOPE for the season in which we live. What is the 2nd derivative of 24x4 Answer is 288x2 of course. So many things in life are choices, including being wise or foolish. Salvation will not be found for everyone and it can be rejected. until Christ comes to rule. The odds of anyone to be able to fulfill all the prophecies that foretold Jesus is 100 times worse than winning the Mega Millions jackpot, which was 1.6 billion DOLLARS! Separation from God certainly has degrees. Just when we thought we were in control . . .
We judge all things according to our standards - stop doing that! A Reminder of who we are and what God has done for us. Why is there so much anger and frustration when things are so much better? Forgetting that our strength comes from the Lord leaves us barren. The Bible is based on historical facts, not fanciful stories, and our faith is dependent upon it. If you feel . .broken, then let Jesus come in and put your life in order. Can you create parallels from Exodus to today . . .It isn't hard. Sometimes our failures are wrapped up in a lack of patience. We need to live like its Christmas time - in other words God is with us. Experience, Intuition, Holy Spirit, or just plain luck . . .Which One? God's yoke and burden is one that we can all bear. Yes, bad things will happen to good people. The power of unity and division is explored. Do you know your part in the best designed plan of all time? We must overcome the natural way with the spiritual way. Positive Reinforcement of Christ's instruction is key to sustained growth. Lets wish each other "God Speed" instead of "Good Luck". We strive with God in our hearts, but God is greater than our hearts. Do you hear the scoffer's words? Just like physical exercise, spiritual strength doesn't happen without sweating a bit - then resting a bit. We know we are saved because of our works. We know of God's grace but how well do we apply grace to others? Peculiar Living according to God is this Easter's Message. You hold the office of an elected official. Now what? Think about that which you wouldn't consider praying for - then just do it! Everything that deviates from the truth is a form of deception and we have all been deceived. Jesus Will Return - Much sooner today than in Paul's time. Christ is in all and above all things. If you're in Christ you are in a safe place. Part of Spiritual Growth is the ability to Rejoice, regardless of the circumstances. Proper behavior in the Christian is required. Freedom is always at risk - from within and without, but why? Paul's living example creates a perspective on serving God. Les and Linda Green were here and sang for us. Les also gave the sermon. Conflicts will always arise, but when does it really matter? We all need an appropriate and balanced view on the Christian Faith.